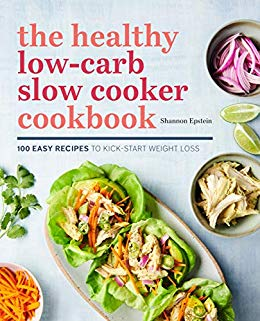 Lose weight and save time in the kitchen with easy, set-and-forget recipes from The Healthy Low-Carb Slow Cooker Cookbook.Eating a low-carb diet can be hard—but cooking for it doesn’t have to be. The Healthy Low-Carb Slow Cooker Cookbook combines the convenience of your slow cooker with satisfying, low-carb recipes to lose weight and save energy cooking.From Sausage and Egg Scramble to Kale Lasagna to Beef Enchilada Casserole, this healthy slow cooker cookbook offers delicious, wholesome meals that have 20g of total carbs per serving. With 15-minute prep times for each recipe, The Healthy Low-Carb Slow Cooker Cookbook makes losing weight as easy as tossing in ingredients—leaving your slow cooker to handle the rest of the heavy lifting.The Healthy Low-Carb Slow Cooker Cookbook includes:Low and slow cooking 101 that offers guidance for making a low-carb diet easy, with recommendations for pantry staples and a sample meal plan.100 low-carb recipes for delicious and satisfying meals that contain no more than 20 grams of carbs per serving.Quick prep with a max prep time of 15 minutes for no-fuss everyday meals.Don’t worry about measuring ingredients, counting carbs, or cooking—make losing weight on a low-carb diet easier with The Healthy Low-Carb Slow Cooker Cookbook.